Bhopal: Dhapu Bai is joyous that she could cast her vote. 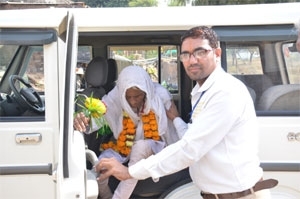 Dhapu Bai, the 103 year old voter of Neechhma of Shajapur district said that she could cast her vote comfortably because of the vehicle, which took her to the polling booth and dropped her back home, otherwise it was difficult for her to reach the polling booth on foot at this age. She appreciates the initiative of the Election Commission of India for providing facility to the weak and elderly to cast their votes. The 102 year old Kesar Bai of Shajapur city reached polling booth sitting in a wheel chair and casted her vote. She said that she always casted her vote in elections. She was finding it difficult this time to cast her vote on November 28 due to the physical weakness. The Commission has facilitated her to cast the vote at the polling booth by providing her a wheel chair facility. Kesar Bai is happy that she got an opportunity at this age despite being feeble and could cast her vote along with her son, daughter and grand children. Moreover, 100 year old Ganjibai, Bhanwar Bai, Kamla Bai, residents of Neechhma, 107 year old Bhagwanti Bai of Jhonkar, 102 year old Bisiya Bai of Panwadi, 104 year old Toisa Bi of Ukawta also casted their votes after reaching the polling booths. These physically weak and centenarian voters described the facility provided by the Commission for polling as a good initiative. The District Election Officer of Shajapur has told that 80 percent i.e. 53 voters out of the total 64 voters of more than 100 years of age in the district have casted their votes in Vidhan Sabha Election-2018. As many as 12 voters in Shajapur Assembly Constituency, 14 in Shujalpur and 27 voters of more than 100 years of age casted their votes in Kalapipal Assembly Constituency. According to the District Election Officer, pick and drop vehicle facility was provided to the centenarian voters. A facility of wheel chair and crutches was also provided at the polling booths for physically weak voters.